Of all the painkillers being used and abused, a single one — fentanyl — has been called by public health officials and even members of Congress the “third wave” of the opioid epidemic. The US Centers for Disease Control and Prevention estimates that of the more than 64,000 US overdose deaths last year from any drug, more than 20,000 were attributed to synthetic opioids, many of them related to fentanyl and its variations. 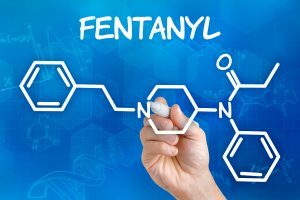 A recent CDC analysis of overdose deaths in 10 states found that fentanyl was involved in 56% of opioid overdose deaths from July 2016 through December 2016. Most of the fentanyl that people are buying on the street isn’t diverted from pharmacies or hospitals but rather illegally made in clandestine labs, much of it chemical variations of legal fentanyl.